When planning my trip to Japan, I had read about a small town around an hour by train from Kyoto and Osaka that wasn’t only full of UNESCO Heritage Sites, but also had a much-loved animal mascot. You may have heard of the Rabbit Island (Okunoshima) in Japan, where tame but wild rabbits run freely around the island chasing down tourists for delicious treats. There’s also Zao Fox Village where different breeds of furry foxes live in a forest surrounding a local village. Not forgetting the Cat Island (Tashirojima) where there are 4 cats to every islander, and counting! 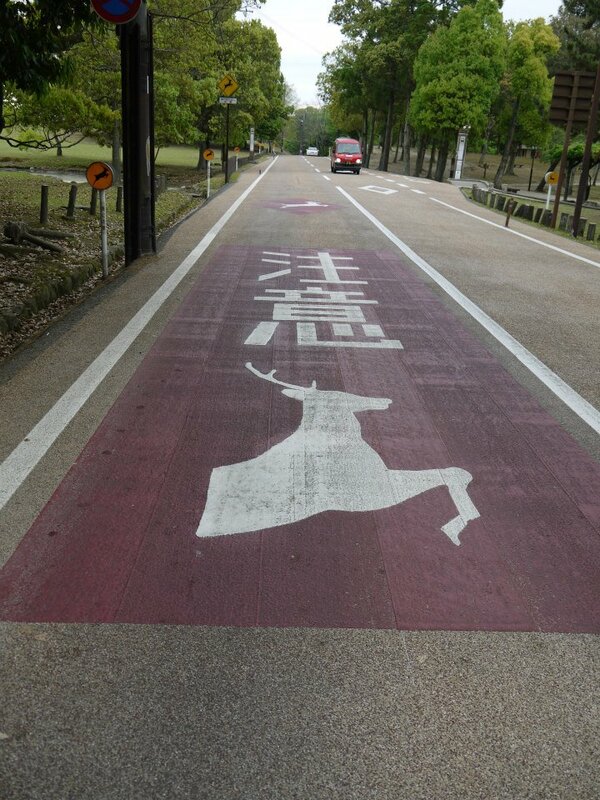 Nara’s animal mascot is the beautiful deer. Numbering over 1,200, they are a protected symbol of the town and are considered to be messengers of the Gods in Shintoism. 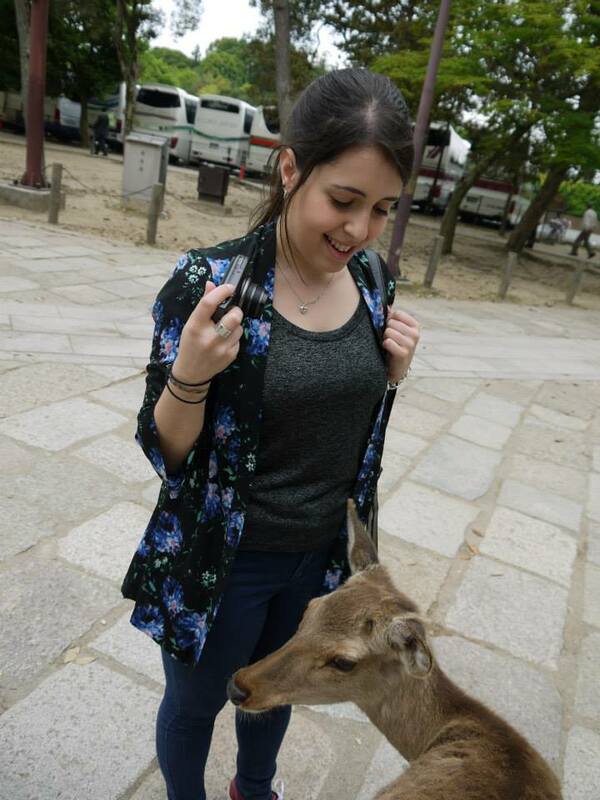 Nara was definitely on my visit list! Nara is less than an hour by train from both Kyoto or Osaka, making it a perfect day trip. Leaving early in the morning, I used my JR Pass on the JR Line to get to Nara for free. The JR station is slightly further than the other train station from the entrance to Nara Park (where most of the UNESCO sites are) but I didn’t mind – plus it meant that I could walk through the charming town on my way (and I had a splendid late lunch in the town afterwards!). The first thing I noticed was a huge painting of a deer in the road, making it very clear to any drivers that deer may make a sudden movement to cross! There were circular warning signs along every road to remind the drivers. It wasn’t long before I saw my first real deer, just in the entrance of the park foraging near some trees. There was quite a large herd of them relaxing in the canopy and they didn’t mind tourists trying to get a closer look, including myself. 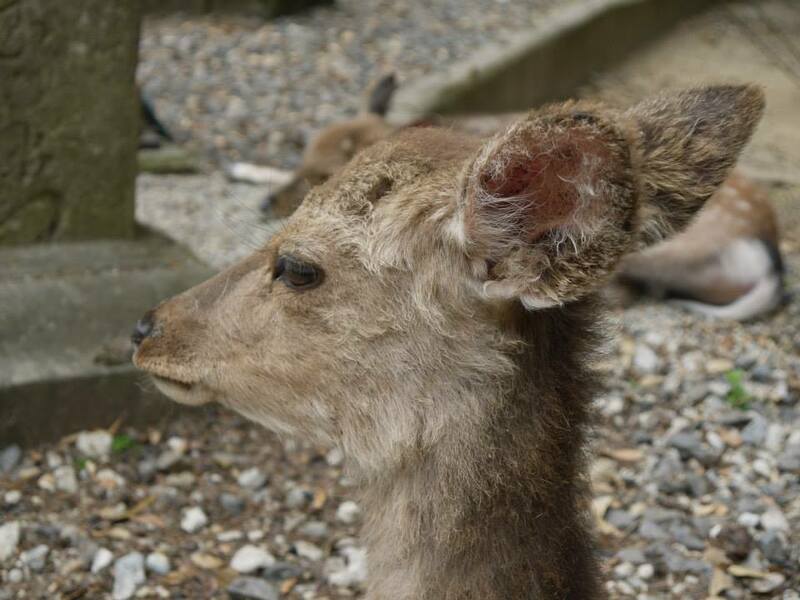 There was a small stall to purchase rice crackers to feed them, and as soon as you had the crackers in your hand the deer would come quite close to you and nudge your clothes and arms. They obviously enjoyed the taste of them! I decided to not purchase any crackers as I was happy enough to just watch and photograph these amazing creatures, though an eager deer must’ve thought I was hiding some tasty snacks as he snuck behind me and licked my hand! After lots of photos, the first cultural stop was Todaiji Temple, one of Japan’s most significant. 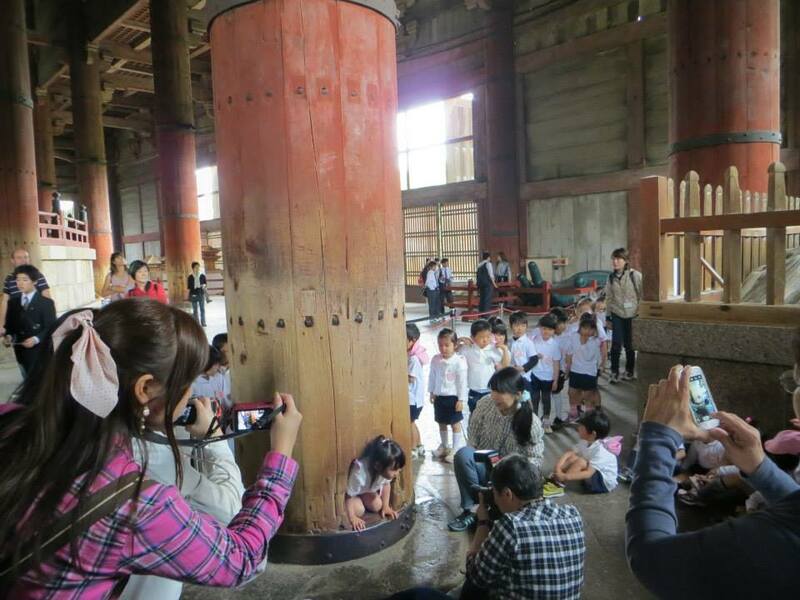 It’s the largest wooden structure in the world, though it used to be a third larger but was destroyed by a fire in 1692. Nonetheless, it was very impressive despite it being a cloudy day. 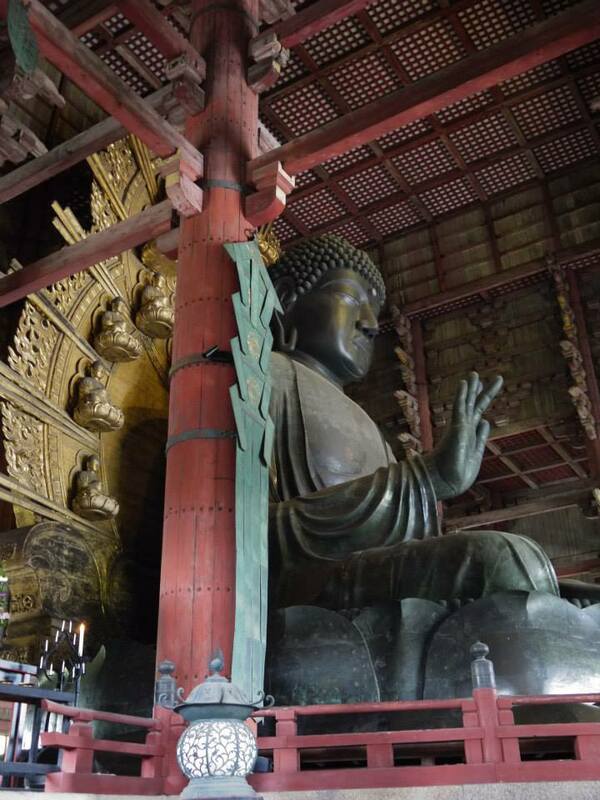 Inside the great wooden hall was one of Japan’s largest bronze statues of Buddha, which stands at 15m tall. To the right of the Buddha, there was a special wooden pillar that had a small hole cut out of its base – the same size as the Buddha’s nostril. I recall reading that those who could crawl or squeeze through this small hole would be granted enlightenment in their next life. There was no chance of me fitting through, but I was lucky enough to witness a large group of young school children being encouraged by their teachers to crawl through the hole. I felt privileged to witness such an event in their lives, even though some were very reluctant to crawl through! I then set off to explore the rest of verdant Nara Park. It was all easily signposted in both English and Japanese, and I headed uphill between tall trees to another temple I wanted to visit. This ended up becoming my favourite temple in Nara Park. Called Nigatsudo Hall, it was eerily beautiful. 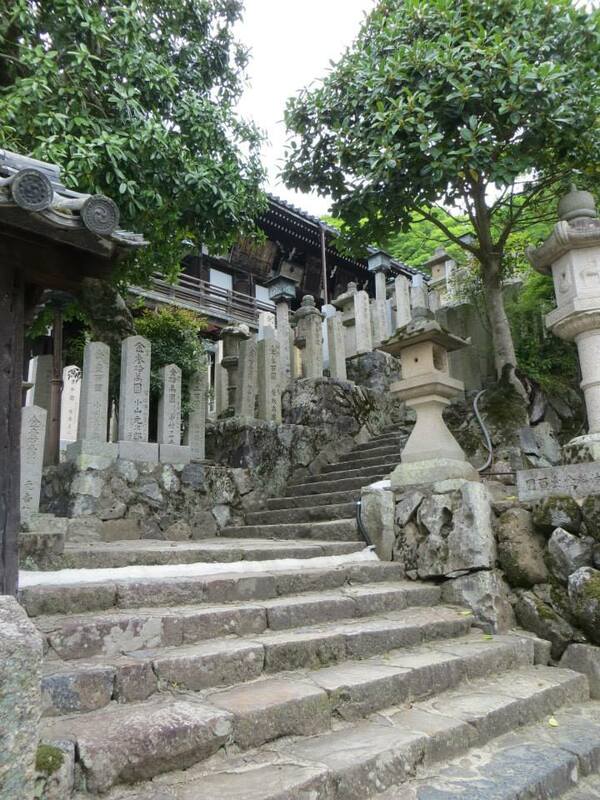 The staircase to the top of the temple was lined with Shinto cemetery stones and the view from the top of the park and the surrounding areas was beautiful. 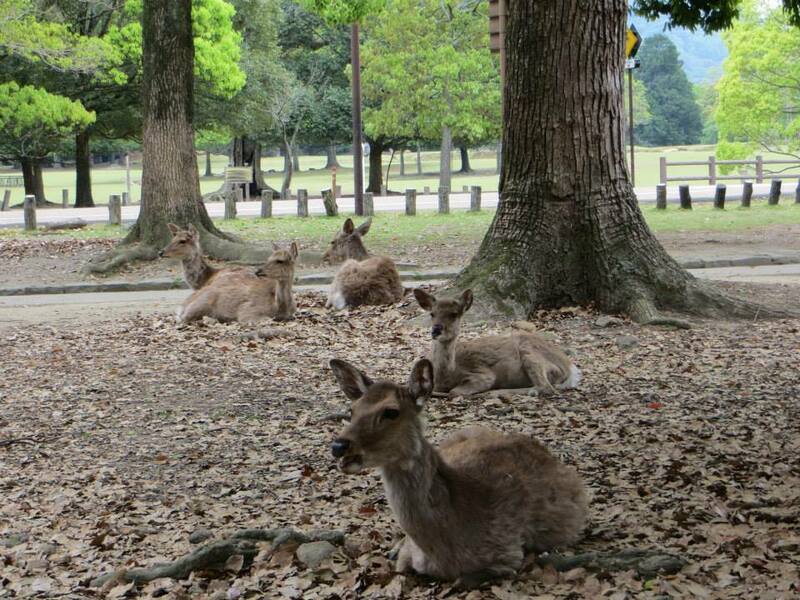 On my walk towards another temple, there was a small area filled with sleeping deer. They didn’t mind as I sat near them. 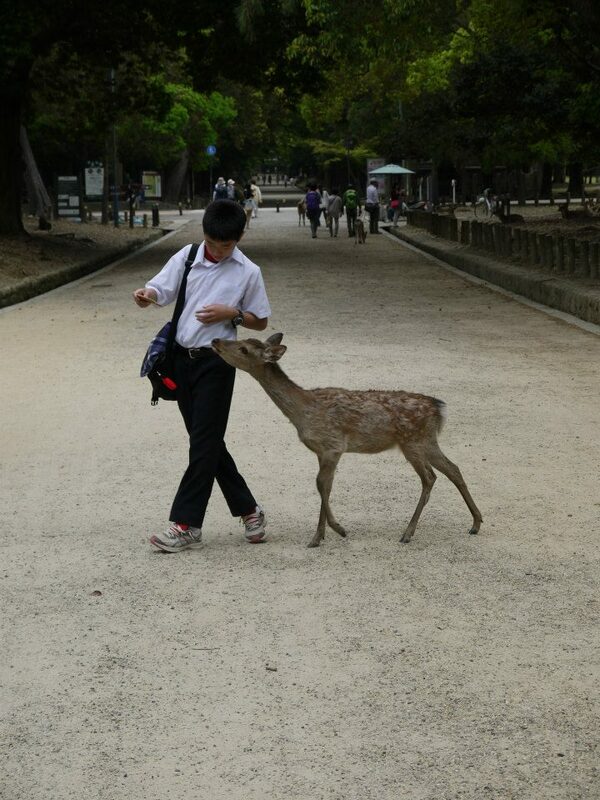 As I left Nara Park, I was lucky enough to witness what can only be described as a deer bowing. 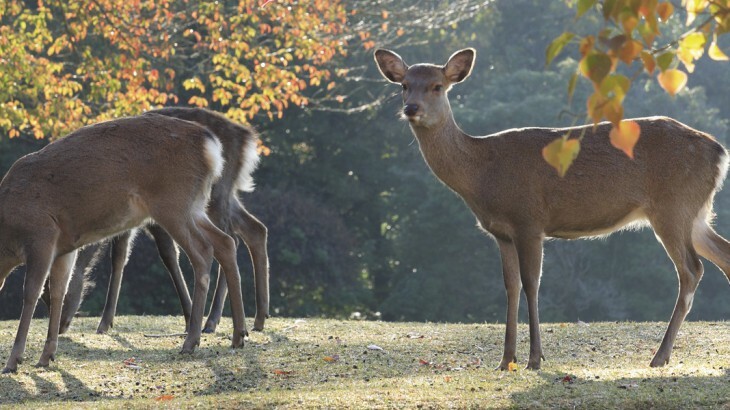 A Japanese schoolchild, whilst holding a few deer crackers, bowed at a deer and then waited for the deer to bow in return before it could receive its snack. It worked! The deer eagerly bowed over and over – it was obviously very hungry – and the schoolchild fed the deer the cracker. On leaving the park and exploring the small town before having a spot of lunch, I felt privileged to be able to visit a place so close to nature. It was amazing to get so close to the deer in their natural environment. 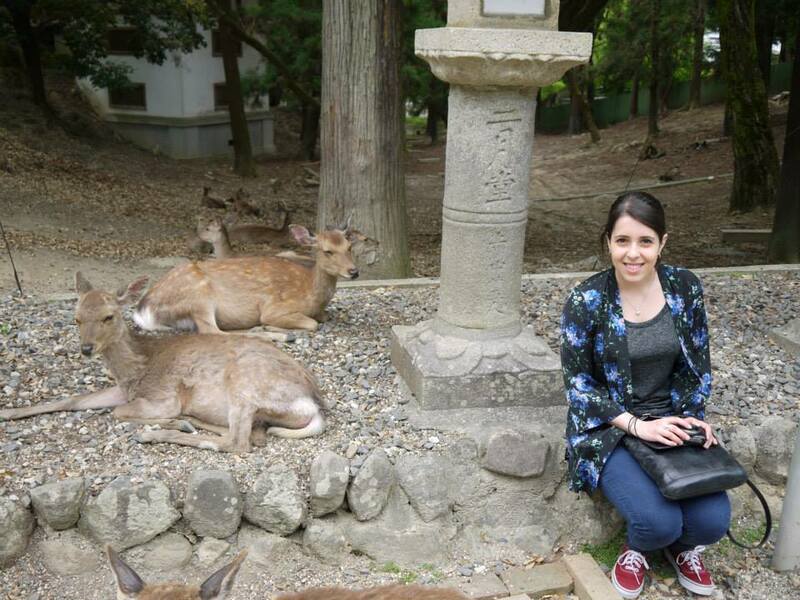 The relationship of mutual trust between the deer and the Japanese was incredibly fascinating to see, and I would recommend Nara to anyone who is exploring the wonders of Japan. 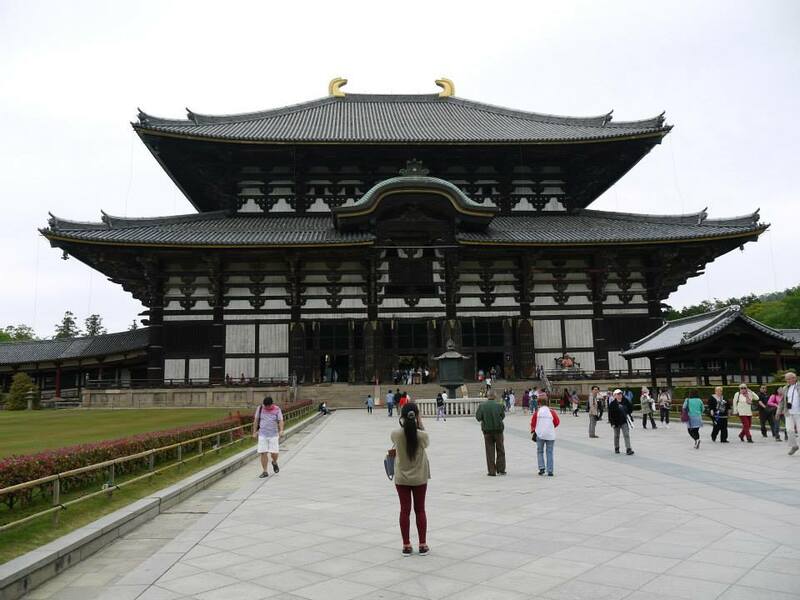 Visit Nara on Wendy Wu Tours’ popular Discover Japan tour! Take a tour of Japan with Wendy Wu Tours, the UK’s leading Asia Experts. Our award winning escorted, fully inclusive tours visit all the major sights of Japan for an unforgettable holiday. Japan nature, sightseeing, unesco heritage site. permalink. Wow wonderful post and images. I visited here in April and I too loved it. Just wished I had more time in Nara.